The Big 4 Chinese smartphone makers (Huawei, Oppo, Vivo and Xiaomi) are expected to launch premium smartphone with LG Display's OLED panels in 2018, which is the first time that the Big 4 confirmed the use of LG Display as an OLED supplier. Reports indicate that 20% to 30% of OLED smartphone panels produced by LG Display went to Chinese companies. Chinese smartphone OEMs maker have been using limited supplies of OLED panels from LG Display since 2015. OLED utilization in China for 2015-2017 is shown in the next chart. If LG is able to deliver to the big 4 they will significantly change the landscape in OLED smartphones built in China. 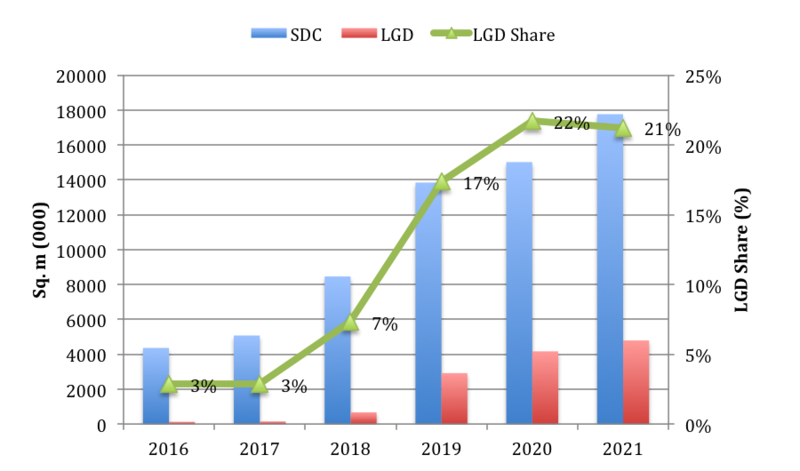 LGD is expected to roll out about 10 million to 15 million premium smartphones with OLED panels (based on 6-inch displays) next year. LG Display’s E2 Plant and Gumi E5 Plant will have a capacity of 75,000 and 60,000 6th Gen substrates/month. According to an OLED investment plan announced by LG Display in July, 15,000 substrates/month will be produced in Paju E6 Plant beginning in the third quarter of next year and 15,000 substrates/month in Paju P10 Plant starting in the second quarter of 2019. They will be able to produce a total of 135,000, which can translates into 120 million to 170 million panels for 6-inch smartphones annually. Apple is expected to receive OLED panels from LG Display beginning in 2019 for the next version of the iPhone X and the iPhone 8 as a strategy to diversify suppliers. In addition, Google is planning to launch the Pixel Phone Pixel 2 in October, and the display was rumored to be supplied with LG Display’s OLED panels. Recent reports from Google indicate that LG was unable to meet their demand and the company shifted to Samsung. Even with LG’s investment, their capacity in terms of sq. m per year will lag substantially behind Samsung as shown below. The current share of capacity between LG and Samsung is 3% and it is expected to grow to 22% by 2020.